The Simms Freestone Fly-Fishing Vest is the most affordable Simms fly-fishing vest on the market and contains great features and is made with 100 percent Nylon ripstop fabric with 100 percent Polyester lining and a padded rib knit collar. This Simms Freestone Fly-Fishing Vest has plenty of storage space for all your necessary fly-fishing gear and accessories with a total of 19 pockets that include 4 chest pockets, 2 large front vertical side entry pockets, 4 waist pockets, 2 large zippered horiztonal waist pockets, 4 internal pockets, 2 internal large zippered horizontal waist pockets, 1 horizontal back pocket. 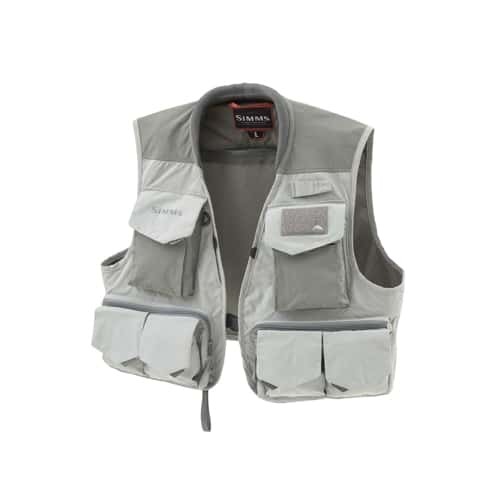 This affordable fly-fishing vest has more than enough storage space for you to enjoy a wonderful day of fly-fishing at your most favorite fishing holes. This Simms Freestone Fly-Fishing Vest is the most popular, affordable Simms fly-fishing vest available on the market today and its innovative, extremely functional design elements make this affordable fly-fishing vest very popular among fly-fisherman all over the globe and you should give it a try as well, especially because of its very low price and great available features.